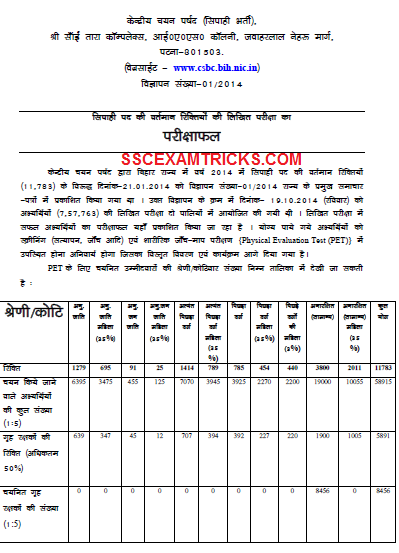 Central Selection Board of Constable (CSBC), Bihar has released result / merit list of short listed candidates for PET of written Test of BIHAR POLICE CONSTABLE Exam 2014 which was conducted on 19th October 2014 for 11783 posts of Police Constable on 19th October 2014 against advertisement 01/2014 at various centres in all over the state. A Total of 7,57,763 numbers of candidates had appeared in the exam. Application of a total of 5848 candidates had rejected due to fill more than one Application Form. A total of 52,715 candidates has qualified for PET in all categories. Those candidates who had appeared in the BIHAR POLICE CONSTABLE 2014 Exam and waiting for their result, they can check BIHAR POLICE CONSTABLE RESULT on the direct link provided below. Earlier it was going to be announced on 10th January 2015 but due to administrative reason, it could not get released. The latest news is that BIHAR POLICE CONSTABLE has announced the PET schedule of these short listed candidates of BIHAR POLICE CONSTABLE 2014. The screening (Document Verification) will be conducted before the PET and PET Admit cards/ Pass / Call Letters will be released to short listed candidates of Screening on the official website of CSBC Bihar. In case any candidate does not receive PET Admit cards/ Call Letter/ PET Pass they must contact to get duplicate admit card of PET at Central selection Board of Constable, Bank Hording Road (Near Secretariat Hall), Patna- 800001 on 13th March 2014 and 14th March 2015. Candidates must remind that NO SECOND CHANCE WILL BE PROVIDED TO ABSENTEES OF SCREENING/PET. · Download the Result / PET Schedule PDF and Cut-off PDF. · Press Ctrl + F on the keyboard and type your roll no. on search box. · Press Enter till you get your roll no. · Save/print the result page / PET Schedule copy for future reference. The Final Selection of Candidates will be done on the basis of performance in written Examination and PET along with document verification/ screening test (including thumb impression verification). BIHAR POLICE CONSTABLE Exam was conducted on 19th October 2014. The BIHAR POLICE CONSTABLE Exam was conducted by Pen MODE. The exam will be entertained through filling of circles on Computer Generated Page (OMR sheet) containing answers as circle on it. The OMR sheet was filled by Blue/Black ball point pen. The exam consists of various sections English, Math, History Geography Civics and General Awareness. The exam will be a multiple choice question paper of 100 questions of 300 marks and four options are provided out of which candidates need to choose one correct answer. The Written Exam level was Up to 10th Standard. The time duration was of 2 hours or 120 minutes. For more information candidate must download syllabus and exam pattern of BIHAR POLICE CONSTABLE exam from the official website. The qualified or short listed candidates are called for Screening (Document Verification) and Physical Efficiency Test (PET). A total of 24 group of qualified candidates are going to appearing first in Screening (Document verification) from 16th March 2015 to 14th April. In the document verification / Screening Test candidates are called to bring original documents along with a photocopy of original document. These candidates are also verified for Thumb Impression to match the originality of the candidate. In the screening Test, Original document of Candidates is to be verified and matching of photo / thumb impression of candidates. All the shortlisted candidates are divided into 24 groups. The short listed candidates will have to qualify PET for final selection for the posts of Bihar Constable. PET will be of qualifying nature and no marks will be added to prepare final list of selected candidates for the posts of CSBC Police Constable. Call letters will be sent to the short listed candidates by posts / courier / available on official zone website of RRC. PET will be conducted for two categories i.e. male and female. · Male candidates will have to run for a distance of 1 Mile in 6 minutes in one chance. · Female candidates will have to run for a distance of 1000 meters in 6 minutes in one chance. · Male candidates will have to jump at least 4 feet high in one chance. · Male candidates will have to jump a distance of at least 12 feet in one chance. · Male candidates will have to throw hammer of 16 Pounds to a distance of at least 16 feet in one chance. 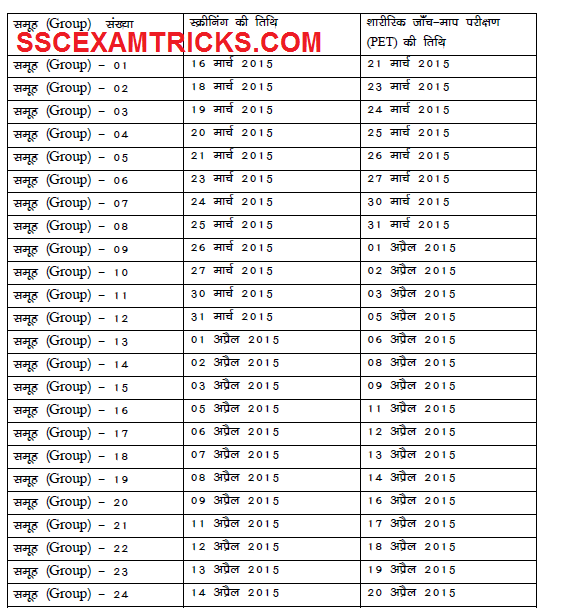 Short Listed candidates of PET will be called for Medical Examination.